Balcatta’s Zeke Ugle (26) and Luke Chan (23), of Mt Lawley, describe the scene as a ‘close knit community’ with audiences interested in listening to a variety of music. ‘The event nights over here are really good,’ Ugle said. 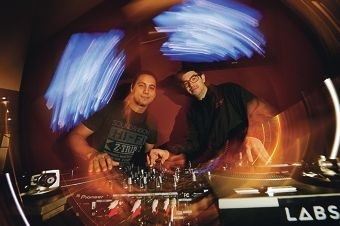 The pair recently opened a DJ school, Lab Six, in an old 19-room converted house in Stirling Street. The school is run from two rooms in the house, the rest of which is used for instrumental lessons and recording by Walther Music. Walther Music co-founder Josh Hopkins said they wanted to make the property an arts hub in Perth, with a cafe opening at the rear of the property and the potential for an art gallery to also open. Chan, aka Charlie Chan, who moved from Melbourne to Perth two years ago, said this was another example of collaboration between musicians in Perth. ‘People here really like music. There is no ego,’ he said. Chan said the idea behind setting up the DJ school was to continue improving the electronic music scene.